As part of an ongoing coverage of China's IPY Polar research projects and activities, SciencePoles recently interviewed Mr Qu Tanzhou, Director of the Chinese Arctic and Antarctic Administration (CAA) responsible for steering Chinese policy and scientific activities in the Polar Regions. 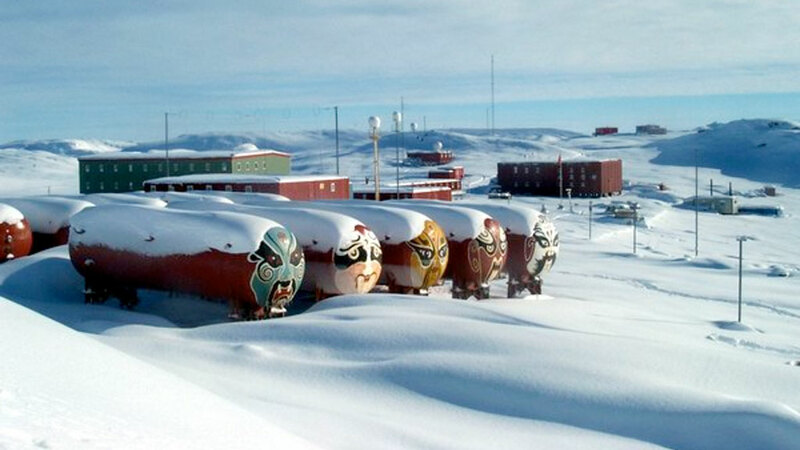 For a quick overview of what research China will be carrying out in the Polar Regions, please have a look at our previous article: Pandas and Snow Dragons: Chinese Polar Research During the IPY and Beyond. Director Qu, how are plans developing for the PANDA and Dome A in this 2007/08 season? Up to now, all the projects of the 24th Chinese Antarctic expedition are being carried out as planned. The Dome A traverse team, comprising of seventeen scientists and logistics personnel reached the summit of Dome A on 12th January. They plan to stay there for about two weeks before traversing back to Zhongshan station. Their main task is to investigate the environmental conditions of Dome A and its surrounding area in order to select the optimum location for the new research station we are planning to build there. They are also set to do some preparation work for future scientific work. Before the inland expedition departed, we contacted the US, Australia, and Germany to explore the possibility of assisting in safety and rescue should something go wrong. Meanwhile in Beijing, Dome A station is still in the process of being approved by the government. We have finished drafting the Comprehensive Environmental Evaluation (CEE) required under the Antarctic Treaty in order to guarantee environmental protection requirements prior to the building of the station. We plan to send it to the Antarctic Treaty Committee for Environmental Protection (CEP) and all the contracting parties to the Antarctic Treaty by the end of January. How have you gone about planning the new Dome A station? We have visited other Antarctic inland stations such as the US Amundsen-Scott South Pole station and the Japanese Dome Fuji station. We also visited the new Belgian Princess Elisabeth station when it was exhibited in Brussels before being shipped to Antarctica, and have learned much about the Franco-Italian Concordia (Dome C) station and the UK Halley station. The point of visiting these inland stations is to learn from others and to design our station by building on their experience. In particular, we are working very hard to put humans first in applying strict safety and environmental principles. For example, in order to reduce the workload and the impact on the environment, adapted containers are selected as the main structure of the new station. What is your timeline for the building of the new station at Dome A? The first phase will be the building of a summer-only station to be constructed from modified and specially adapted containers. We then have a plan to keep building and improving on the station in order to turn it into an all year station within the next ten years. In parallel, in order to overcome logistical problems relating to supply and transport of personnel, we are planning to commission a specially adapted plane that will be built here in China in the future. But in the meantime, we are exploring the possibility of using Australian air support to transport some of our goods and personnel to and from Dome A. Once the station is built, what is the science programme at Dome A? The main disciplines at Dome A will be deep ice core drilling, glaciology, astronomy, atmospheric science, weather observations, and also studying the geology of the Gamburtsev mountain range that lies beneath the ice cap under Dome A. In addition, we will also continue transect investigations and observations between Zhongshan station and Dome A, including continued surveying. Will this programme be carried out in a context of international collaboration and the International Polar Year (IPY)? Of course, the station at Dome A will also be a platform for international cooperation. Conditions permitting, we are very willing to cooperate with countries that have similar interests as us. But because we still have a lot for weight to transport to Dome A for the construction of the station, this kind of collaboration will be difficult for the next few years. In the future, however, we will try our best to facilitate this kind of cooperation. Interest has already been expressed by Korea, Japan, France, Germany and Australia, but logistics are binding and some science projects, such as deep ice core drilling, take years to develop. They cannot be deployed at short notice. We have talked about Antarctica, but what scientific research are you carrying out that is specific to the Arctic? Our foray into Arctic research is more recent than for Antarctic research, however, China does have a scientific research station Yellow River on the island of Svalbard, and we will also deploy our research icebreaker, the Xue Long (Snow Dragon), in coming years. Our main focus in the North is on air-sea interaction, oceanic geology and biology, weather observations and glaciology. Yellow River station has also proved a very fruitful platform for consecutive aurora observation. Can you give us an idea of what the annual budget is for Chinese Polar research in both the Arctic and the Antarctic? In general, the annual operating budget for the programme is US million, but this figure only includes the cost of logistics and of running the station, and excludes science project and the Xue Long's Arctic cruises as it does not necessarily go to the Arctic annually. How would you sum up the evolving the Chinese perspective on climate change? The Chinese government is very concerned and has already devised a plan to respond to the challenges of climate change. But to really understand global change in all of its complexity, we still need more time and a greater breadth of research. This is because a few decades of change represents very little in the long history of climate evolution. As for the question of how significant are human activities in the context of climate change? In my opinion, this needs more research and study. As we know, the Earth is part of the solar system, and principally dependent on the sun as its main source of heat. But right now we can't answer how the solar system is affected by greater galaxy systems and so on. In addition, regional change is too often mistaken for global change. The winter in Beijing is warmer this year, but at our Great Wall station on King George Island on the Northern tip of the Antarctic Peninsula, it has been colder than usual in the last few months. Yet we can still consider the two as part of global change. So to what extent are human activities responsible for this? We can't give a definite answer to that question. What we can do, however, is to ensure that human activities have a positive, rather than a negative effect on this change. In my view, humans are part of nature, and human activities should be taken as part of natural evolution. We shouldn't separate human evolution from nature's evolution. More important still, we should not oppose them! China is interested in developing a harmony and balance between the two. Dr. Qu Tanzhou is the Director of the Chinese Arctic and Antarctic Administration (CAA), which is in charge of carrying out China's polar research objectives.